Anna University Exam Time Table Nov Dec 2018 PDF Download (Regulation 2008) – Annamalai University November December Term End Examination Date Sheet has been released on the official website and is given below. On 29th August 2018, the board also informed that the examinations for the Distance Education Supplementary Examinations for the year 2018-2019 will be conducted from 26th December 2018 in Tamil Nadu and other states at the following centres. The examination application form, timetable and the instructions to the candidates, can be downloaded from the University website www.annamalaiuniversity.ac.in. 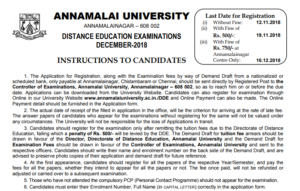 The application form for December 2018 examination should be sent along with examination fees in the form of Demand Draft to the controller of examinations, Annamalai University, Annamalainagar. Candidates will not be permitted to write the examination without the Hall Tickets. Online exam fees payment facility is also available. 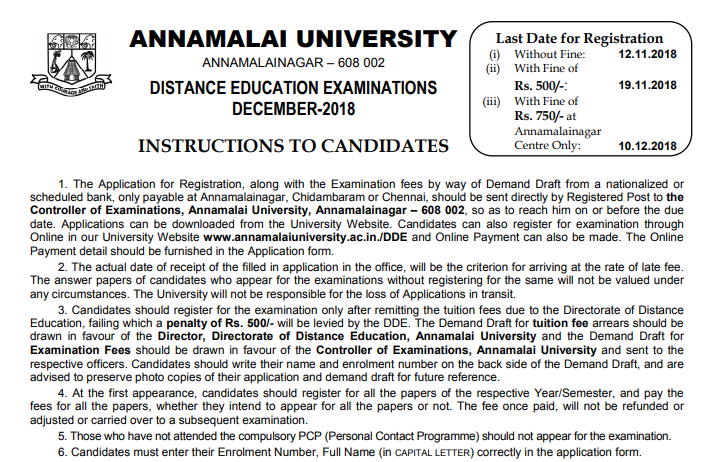 Here, from the side of Annamalai University Distance Education Examinations December 2018, last date for registration without fine is 12 November 2018 and with fine of Rs. 500 is 19 November 2018. Also, with a fine of Rs. 750/- at Annamalainagar Centre Only is 10th December 2018. Latest updates related to Anna University Exam Time Table Nov Dec 2018 PDF Download (Regulation 2008) will be published on this page of ALLINDIAROUNDUP website on regular basis.